(IVP Academic, 2000, softcover, 228 pages). Some evangelicals hold that the wicked will experience perpetual, conscious torment after death. Others argue that the wicked will experience a limited period of conscious torment and then their existence will come to an end. 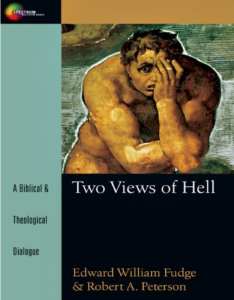 In this book you will find a frank debate between two evangelical theologians who present strong scriptural and theological evidence for and against each view. Robert Peterson defends the traditional view while Edward Fudge advocates the conditionalist perspective that after a period of suffering, the unfaithful will experience a complete extinguishing, or annihilation, of existence. In addition, each author presents a rebuttal to the viewpoint of the other. Here is a dialogue that will inform and challenge those on both sides, while impressing on all the need for faithful proclamation of the gospel of deliverance from sin and death. ENJOY a 2000 review from New Zealand here. The book is much needed. The debate over the nature of hell shows no sign of going away, and this book gives a good and thorough presentation of both sides in just over two hundred pages. I hope it receives a wide and careful reading. Fudge and Peterson . . . have produced a clear and readable account of the biblical grounds for their positions. Fudge's interpretations of the scriptural data is plausible as is Peterson's and neither can dismiss the other by claiming that Scripture clearly supports their view. This book serves well the purpose of laying out the exegetical grounds for both sides. A very worthwhile book, especially since it gives both sides of the argument. This gives the book a fairness that should be appreciated.